Condition Excellent with only fine pitting under a red-brown patina consistent with exposed indoor preservation; the blade solid and straight. This sword blade, with edges curving as they do to an acute point, has been classified by Oakeshott as being of his type XVIII, however, it could have very well fallen into type XV when it was new. The blade narrows fairly quickly from its origin at the crossguard, and the noticeable asymmetry of the blade in this area strongly suggests this blade was heavily rehoned during or just after its working life. The blade has a flattened diamond cross-section with a very well-defined central ridge running down the center of each face. The four blade facets (two to each side) are quite concave (hollow ground) such that the blade rapidly thins away from the central spine towards the edges. This sword was once in the collection of Ewart Oakeshott who partially cleaned the blade and wrapped a crude replacement wooden grip with cord. Oakeshott (1987 and in Records...1991, p. 176) characterizes the "reddish-brown patina" on the iron elements of the hilt and upon a portion of one side of the blade as being characteristic of a long build-up of grease and dust such as are associated with swords preserved but exposed in such indoor environments as churches and castle halls. 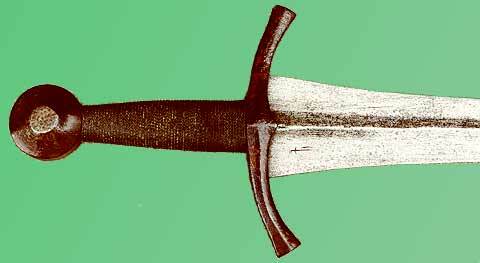 Oakeshott reports exactly such a patina was also present upon a sword found in Westminster Abbey which is attributed as being that of Henry V.
The mark on this blade (illustrated to the left) is similar to marks seen on swords associated with a battle between the Swiss and Austrians at Sempach in 1386 and is interpreted by Oakeshott as representing a dagger and more likely being the mark of the cutler who mounted the hilt (1987, p.11) than that of the smith who made the blade. While precise dating is not possible on the basis of the blade form in the case of a long lived blade form such as this or from the simple beveled wheel pommel, Oakeshott (1991, p. 176) notes that the style of the crossguard was popular in the 13th century, but not long thereafter and has assigned dates of 1290 to 1320 as being most likely for this sword.